As many of you already know, 3Dwalkthroughs.com is involved with Fitspott, a social networking platform for health and fitness. In the time since becoming involved with this project we have read countless social media books, articles, blogs and have also attended various speaking engagements on this topic. If there is one fact that has become clear during our forray into social media its that all companies, large and small, have an opportunity to conduct a much more targeted marketing approach, to a much bigger audience, and for much less money. What does this means for 3Dwalkthroughs.com and it’s customers? Basically any 3D asset we create whether it be a 3D Rendering, 3D Floor Plan or 3D Walkthrough has a potential of going viral by being posted and tagged on one of the multiple photo/video sharing sites. Furthermore tools like Twitter, Facebook, MySpace and many more can be used by developers to build a captive audience well in advance of the first shovel hitting the ground. Over the next few weeks, 3Dwalkthroughs.com will be highlighting many different social media tools and will explain how they can be used to market a property. In honor of this monumental week 3Dwalkthroughs.com thought we would share an unbelievable 1,474 megapixel image that was taken during the inauguration. The image when pulled back shows almost all the people that were in attendance during the ceremony. The amazing occurs when you start to zoom in. Click here>> to see it. Using the controls, pick a spot and start to zoom in on the image. No matter where you zoom you can see each persons face as if a close up picture was taken. When I think about the ramifications of this it is both compelling and a little scary. Here is how it was done, told by the photographer David Bergen. I clamped a Gigapan Imager to the railing on the north media platform about six feet from my photo position. The Gigapan is a robotic camera mount that allows me to take multiple images and stitch them together, creating a massive image file. 3Dwalkthroughs.com came across a story on Gizmodo.com about CNN’s request to contribute digital photos of todays historical event that will be used to create a massive 3D experience. CNN will use Microsoft’s software, Photsynth to compile the collage, as they turn 2D images into 3D images. According to the article, all you have to do is take a picture (under 10 MB), send it into themoment@cnn.com, and then wait for Microsoft’s software to do it’s thing. I would personally like to wish Barack Obama and the rest of his team the best of luck as they make history on this monumental day. Today is a great day to be an American! 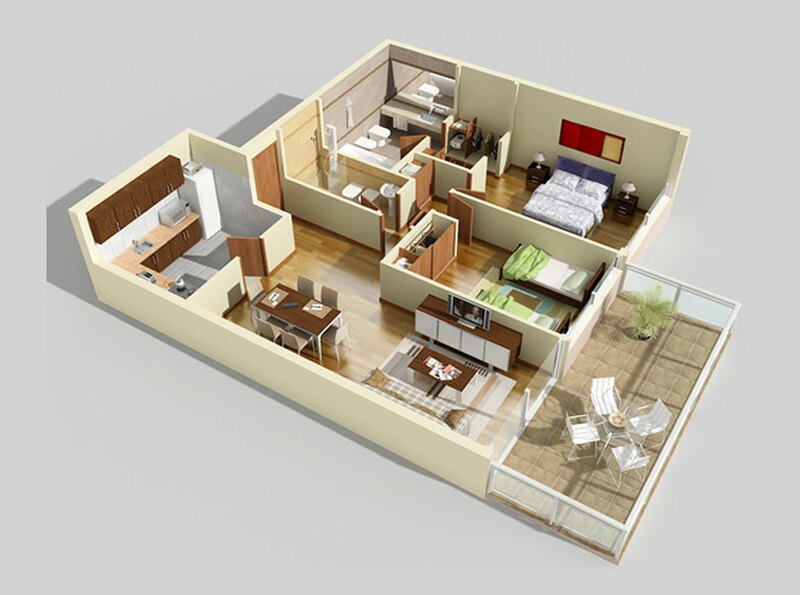 3Dwalkthroughs.com has noticed an definitive upward trend in the number of people interested in 3D floor plans. The increased traffic seems to be the result of the companies which made the decision seek out innovative marketing tools in spite of the tough economy. We have experienced a marked increase for 3D floor plans of residential, commercial, retail and hospitality real estate. The customized 3D plans can demonstrate a properties layout much more effectively than a standard 2D plan. 3D floor plans can be customized down to the smallest detail. They can showcase the type of flooring, wall covering, furniture layouts/styles, cabinets, door knobs, etc. The turnaround time for a 3D floor plan is approximately 5 days, and they can be used for websites, billboards, printed brochures, wall plaques etc. If you are interested in getting more information please feel free to contact us at any time. 3Dwalkthroughs.com is excited to announce that the Fitspott blog has been selected to be today’s featured blog on Typepad. This is quite an honor considering the amount of blogs created by Typepad users. Fitspott‘s blog is an interesting and innovative way to get people excited about a launch through the use of their TypePad blog. The Fitspott blog is a way to ramp up excitement for the beta of the Fitspott community, keeping people abreast of the development progress there. It’s also a fascinating look behind the scene of the company culture, and a way for the company and community to communicate. They’ve also got interesting reportage from what it’s like inside a fitness industry trade show, what it means that “childhood obesity” is now a top search term on Google, and how viral video is becoming a new trend in innovative sports marketing. There’s even some new possibilities for listening to music while you work out, the a new year’s post about how the government is targeting obesity rates. 150 Million Superbowl Viewers To Be Sent 3D Glasses? 3Dwalkthroughs.com came across about an interesting story about a promotion during the Superbowl that is supposedly going to involve the giveaway of 150 million pairs of 3D glasses. Katzenberg promises that the viewing quality will be superior and says the glasses will use Intel InTru 3D and ColorCode 3-D, which updates the old red-blue Anaglyph system. They will be distributed free at Pepsi/SoBe Life Water displays at 28,000 locations including grocery, drug and electronics stores and big-box retailers. If nothing else it will be very funny to watch all the drunk football fans running around with their 3D glasses on. How many people do you think are going to get pulled over as they try to drive home with their 3D glasses on? You are currently browsing the 3D Walkthroughs blog archives for January, 2009.